Adjaye, BIG and DS+R reveal shortlist designs for Adelaide Contemporary. 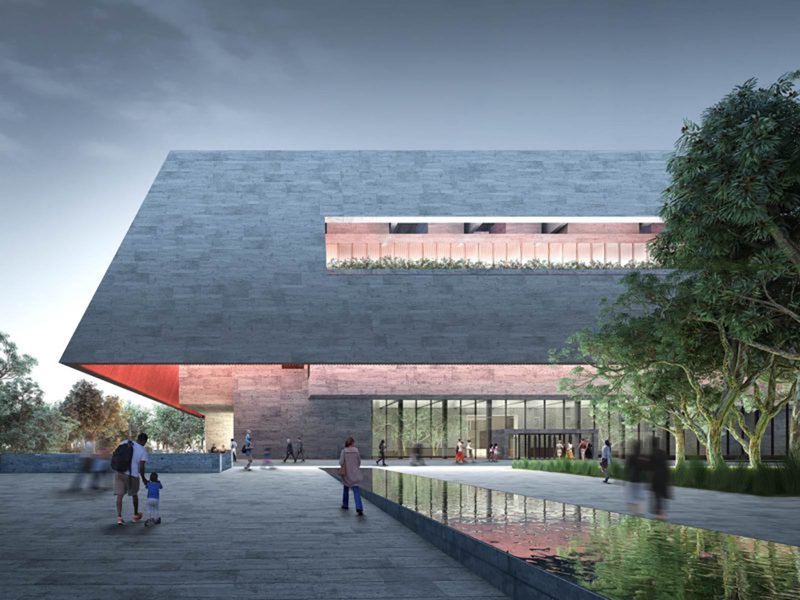 Adjaye Associates' design proposal for the art gallery and sculpture garden (Courtesy Malcolm Reading Consultants). On May 11, Arts South Australia’s design jury revealed the design proposals from the six shortlisted teams selected in the Adelaide Contemporary International Design Competition, a planned art gallery and sculpture park in Adelaide, Australia. The 160,000 square-foot Adelaide Contemporary will house a significant portion of the Art Gallery of South Australia’s 42,000 piece collection, which currently only has a fraction on display due to a lack of space. The museum will draw upon its substantial Aboriginal collection to create the Gallery of Time, which will combine indigenous pieces with European and Asian works. This shortlist’s designs follow. Adjaye Associates & BVN’s design draws upon Aboriginal vernacular architecture through the use of a surrounding canopy, providing shade in one of the more arid corners of the country. With the canopy screening significant portions of the four elevations, the design will largely use skylights and balconies to filter natural light into the central atrium and stairwell. With a twisting, serpentine layout, Bjarke Ingels Group (BIG) & JPE’s proposal is inspired by Aboriginal sand painting, which often embeds abstract natural elements within a landscape. Through the use of rooftop landscaping, the team hopes to integrate their design with the adjacent Botanic Garden. David Chipperfield and SJB Architects’ is the only timber structure proposal. The principal elevations are composed of wooden screens, and the structure is topped by sloped roofs. In a statement, Diller Scofidio+Renfro & Woods Bagot describe their proposal as a “matrix of unique spaces unbound by disciplinary categories range in size, height, infrastructure, and light quality.” The bulk of exhibition space is located on the second story, which is cantilevered over an outdoor gallery and public square. Hassell & SO-IL incorporate a central plaza into their design proposal, which the team describes as an attempt to bring “nature, art, and people together.” The central plaza serves as a circulation node and public square connecting the gallery’s semi-independent spaces, which are further laced together by a draped, metal brise-soleil. Khai Liew, Ryue Nishizawa & Durbach Block Jaggers proposal consists of a sweeping, perforated canopy supported by a series of pilotis. Beneath the canopy, the site is split roughly evenly between park and curatorial space, the latter presenting sweeping views of the adjacent Botanic Garden. Arts South Australia’s design jury will meet again in May, with a winner expected to be announced in June.